We already know that every kid hates Brussels sprouts. I was no different. So let’s call it an acquired taste, like asparagus or better yet, beer. 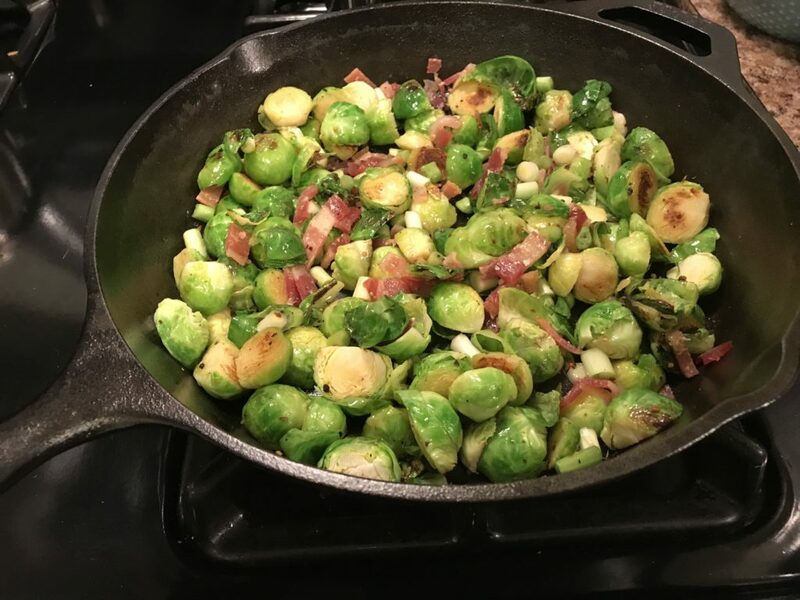 All I know is I love bacon and skillet-fried Brussels sprouts. Here’s my version of this colorful and tasty side dish that would be a great addition to your holiday table. In a No. 10 cast iron skillet, cook the bacon over a medium heat until done to your preference. While the bacon is cooking, thoroughly wash Brussels sprouts and half lengthwise with a knife, trimming off the bottoms. Chop the sweet onion. Remove the bacon when it’s done and drain on paper towels. Maintain 3-4 tablespoons of bacon fat in the skillet and the rest for use later. Add the sweet onion to the skillet and cook until translucent, 8-10 minutes. Remove onions from the skillet. Replenish bacon grease as needed, and add the Brussels sprouts, stirring to coat with the bacon fat. Carefully add the water, and cook the sprouts for 15-20 minutes over a medium heat, stirring frequently until browned and partially tender. Chop the bacon into bits, then add it along with the cooked onion to the pan with the lemon juice. Reheat and add kosher salt and fresh-ground pepper to taste. This should serve eight people.